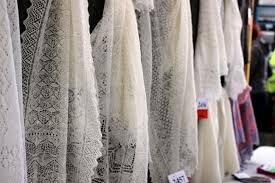 Time to Get Your Lace ON!!! Choose from four workshops—there is something for advanced beginner to advanced level knitter. Be the first Studio customers to see Denise’s TRUNK SHOW and shop at a Yarn Market filled with the luxurious hand dyed yarns from Lost City Knits. Laugh and learn with fellow knitters in the classroom and gathering spaces at the Unity Village Conference Center. What Is Shetland Island Lace Knitting? The Shetland Islands are located north of Scotland where the Atlantic Ocean meets the North Sea, closer to Norway than it is to Great Britain, of which it is part. It is a starkly beautiful land with windblown uplands and craggy cliffs tumbling down to wave-tossed water below. 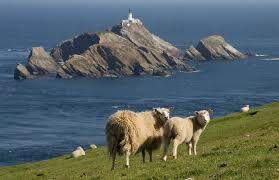 The islands’ isolated location as well as the cold and windy climate have created a long tradition of knitting shawls, often made from the natural colors of Shetland Island sheep. The Studio Knitting and Needlepoint Shop brings this special tradition to Missouri for a skill-filled weekend at the August. It may not be as cold here as on the Shet-land Islands but there are some cool things to learn. When she was growing up, Denise always per-formed some kind of handwork. When she learned to knit she was instantly addicted. 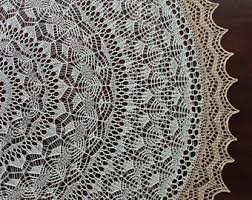 Wherever she looks, Denise sees patterns, so it’s no surprise that her knitting emphasis is lace. Travel and spending time in the natural world provide inspiration. 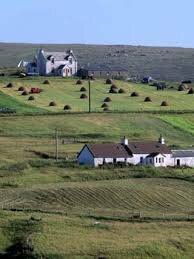 She recently visited Shetland and Scotland to delve further into the history of fine lace knitting. Her business, Lost City Knits, named for the community nearest her Oklahoma farm, offers fine hand-dyed yarns and original designs. Denise is a nationally recognized teach-er and member of TNNA. 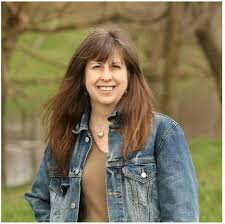 When not knitting, teaching, dyeing or designing, Denise puts her pattern-seeking abilities to work solving cryptic crossword puzzles, and because no one can do just one thing, she also kayaks on lakes and streams near her eastern Oklahoma home. Along with her husband, she is the author of the book Ultima Thule: Patterns Inspired by the Shetland Islands. Special Opportunity to Stay & Play!! Make your weekend a mini-retreat. Hotel rooms are available at the Conference Center for knitters who are enrolled in class(es) at this event. Rooms are $119 single or double occupancy. You are responsible for booking your room for you and your roommate(s). Please call the Unity Reservation Department at 1-866-348-6489 OR 816-251-3540 to book your room. Tell the reservation taker that you are part of the Studio event. Click on the Class links below to learn more about the classes and sign up. You can sign up online using the links above or over the phone - 816-531-4466 or in person.